I went out to dinner the other night with friends and honestly it was hard. Finding options that work for the Dukan diet isn’t always easy, even when you try to choose straight protein and veggies. As soon as I start asking how things are prepared I learn about secret fats, oils, and sugars that are used. 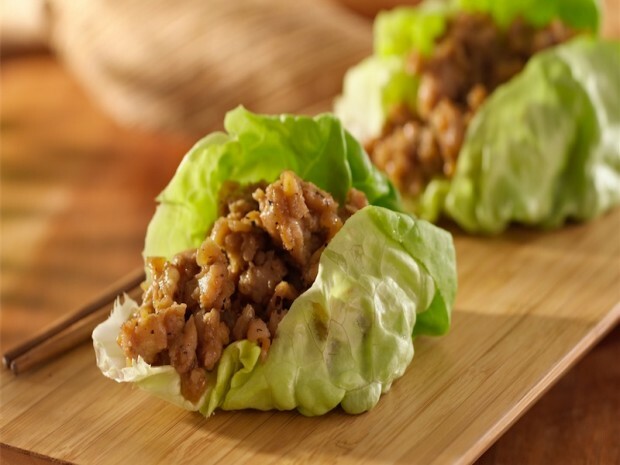 For example when I asked about the chicken lettuce wraps, which I thought would be a relatively safe option, I learned that they are loaded with oil and sugar. So I thought I would create my own, Dukan friendly version once I got home. Here they are. 1. In a large skillet brown the ground chicken and pour off any excess fat. 2. Return the chicken to the skillet and add the garlic, scallions, red pepper, water chestnuts, soy sauce, water, and chili paste. 3. Cook for about 5-7 minutes or until the red pepper begins to soften. 4. Stir in the cilantro and serve immediately in the lettuce cups. Serve with Asian chili paste and soy sauce as dipping sauces.